Coconut oil may remind some of us parents of the nostalgia that goes along with coconut. We may be reminded of the coconut scents that went into tanning oils and coconut flavors that went into drinks like piña coladas. Now, coconut oil has gained traction amongst all health markets, including skin care. There is no doubt- coconut oil is a natural oil that is favored because of its natural and healthy versatility in uses. Dr. Amy and the Baby Pibu team want to review what coconut oil is, what type to use, and the coconut oil uses for babies. Pure coconut oil is made from dried coconut meat through a milling and crushing process and without additives. Virgin coconut oil is derived from the milk of coconuts so it still maintains the natural coconut scent. The nourishing antioxidants are maintained because there are no additives and no chemical or mechanical processing. Refined coconut oil undergoes both chemical and mechanical processes like refining, bleaching, and deodorizing. It is odorless. Organic coconut oil is extracted from coconut trees that have not been grown with pesticides or other chemicals. Now that you know the different types of coconut oil that exist, here is the coconut oil that you want to buy. Buy solid virgin coconut oil- liquefied oil means it underwent extra chemical processing to become and stay liquefied at room temperature. When you read a label, look for unrefined, extra virgin, and cold-pressed. Avoid any label that says deodorized. Coconut oil typically remains solidified at room temperature, but when placed on the warmth of the skin it becomes a liquefied oil. Organic is typically not necessary since residual pesticide is not typically found on the coconuts. However, if you decide to buy a refined coconut oil, then buy 100% organic, cold-pressed coconut oil. Organic production does not allow for the use of the chemical hexane, an oil-extracting chemical. Coconut oil has gained popularity because of its health benefits for our body inside and out. Let’s learn a few key benefits of coconut oil- this will help you determine whether you want to use coconut oil on your baby’s skin. When considering a food-based product, you have to consider a food allergy risk. Take comfort. Coconut oil is one with a very low allergen profile. So, if your baby has shown no signs of a coconut allergy, consider using coconut oil on your baby’s skin. Topical virgin coconut oil is moisturizing! Several medical studies have shown coconut oil to be just as or more moisturizing than the standard mineral oil. 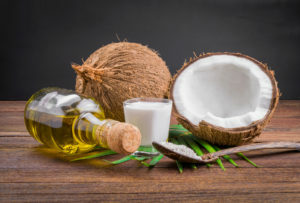 A 2014 study in the International Journal of Dermatology showed topical virgin coconut oil to be superior to mineral oil in improving mild to moderate eczema (atopic dermatitis) in pediatric patients. Topical virgin coconut oil is antibacterial! Coconut oil contains a significant amount of lauric acid, which contributes to its antibacterial properties. A 2008 study in the journal, Dermatitis, showed topical virgin coconut oil to be an antibacterial against the concerning bacteria, Staph aureus. Staph aureus is a common bacteria found in both pediatric and adult eczema patients. One concern of Staph aureus in eczema patients is that this bacteria actually drives and stimulates the eczema process and ultimately makes eczema worse. Now, let’s consider coconut oil use for babies. Use coconut oil as a moisturizer. Virgin coconut oil will be solid when it is at room temperature. After a nighttime bath for baby, use coconut oil on your baby as a moisturizer while baby’s skin is still damp with water. Another use of coconut oil for babies is as a natural topical antibacterial salve. Because of its antibacterial properties, virgin coconut oil can be used on minor cuts and abrasions. The next time you have a minor cut, pull the coconut oil off your kitchen shelf and use it instead of your Neosporin or Polysporin. Of course, if there is a more serious injury or wound, ask the doctor! Use coconut oil for your baby as a natural diaper rash salve. Because of its moisturizing and anti-germ properties, virgin coconut oil can be a natural diaper rash remedy. The lauric acid in virgin coconut oil is thought to provide antibacterial, antiviral and antifungal activity. The antifungal property can help fight against developing diaper rash. Coconut oil acts as a natural sunscreen. Virgin coconut oil provides a SPF 4. Know that when you use coconut oil for your baby as a moisturizer that you are also providing some additional sunscreen to your baby’s skin. Another coconut oil use for babies is the prevention and soothing of baby eczema. The combined moisturizing and antibacterial properties of coconut oil allows eczema individuals to stay moisturized and to have less risk of harboring bacterial germs such as Staph aureus, which worsens eczema. Treatment for cradle cap is another coconut oil use for babies. Cradle cap commonly affects babies up to 6 months old. The lauric acid in coconut oil can help lower the amounts of cradle cap triggering yeast, Malassezia furfur. Consider applying coconut oil twice weekly to prevent a case of cradle cap and apply it daily when there is a cradle cap flare. Finally, consider a baby massage with coconut oil as another use for babies. A baby massage can help calm and nurture a baby. Babies with eczema have increased stress that results in increased itching and worsening flare-ups. A massage for a baby with eczema can serve to de-stress baby and eventually reduce itching. All in all- consider virgin coconut oil as a safe, natural option to use on your baby’s skin. Stick with virgin coconut oil and consider all of these reasonable uses for coconut oil on your baby’s skin.